The nation of Cuba faces many challenges as it moves into the future. Aside from economic hardships and political issues the country must contend with ailing and often obsolete infrastructure. Among the infra-structure systems of greatest concern are the water and wastewater systems. These two systems are essential for the health and well being of citizens. The following is a study on the state and outlook of Cuba’s water and wastewater infrastructure. 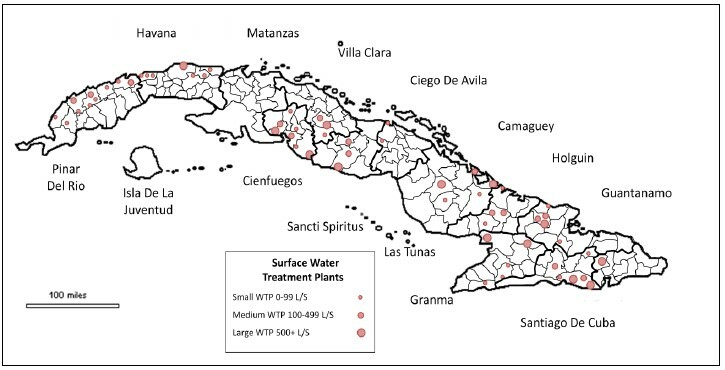 The first half of the paper deals with the water system portion, and begins with an overview of Cuba’s water sources. This discussion includes an inventory of these systems along with an analysis of the current capacity and demands. Also included is an order-of-magnitude cost estimate for the improvements necessary to provide an appropriate level of service. This section closes with a set of recommendations. The second half of the paper involves the wastewater infrastructure and follows a similar pattern. The paper ends with overall conclusions. Cuba’s water supply consists of two general categories, surface water and groundwater. These sources are managed on a national level by the ―Instituto Nacional de Recursos Hidraulicos‖ (INRH). Cuba’s surface water originates from water-sheds containing a wide array of rivers and streams. These watersheds provide more than 65% of Cuba’s available water and make up more than 80% of the potential wa-ter supply. In total the island consists of 632 watersheds containing an estimated 31.7 bil-lion cubic meters of water. Cuba’s water-sheds are generally found to the north and south of a dividing topographic ridge which runs through the center of the island (Garcia Fernandez, 2000). The governmental agency that manages and has authority over Cuba’s watersheds is the ― Consejo Nacional de Cuencas Hidrográfi-cas‖ (CNCH). This agency has identified the eight watersheds of highest national priority based on economic, social, and environmental significance. In total these watersheds encompass slightly more than 15 % of Cuba’s territory, supplying water to approximately 40% of the population and contributing to 60% of all economic activity. Cuba’s eight high priority watersheds are the following: Cuyaguateje, Ariguanabo, Al-mendares-Vento, Hanabanilla, Zaza, Cauto, Guantanamo-Guasa, and Toa. 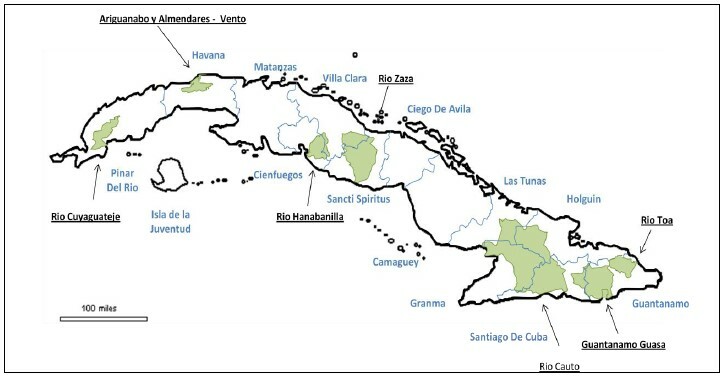 At least one priority watershed is located within 11 of the 14 provinces in Cuba. (Garcia Fernandez, 2000). The nation of Cuba benefits from a sizable amount of groundwater totaling an estimated 6.4 billion cubic meters. 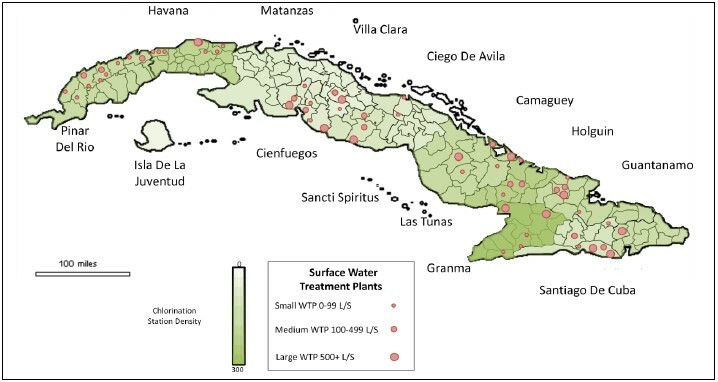 Groundwater in Cuba is mostly found within carbonate rocks and is of the calcium-bicarbonate type. There are several regions of the country in which groundwater is predominantly used (Cereijo, 1992). These regions include La Habana, Matanzas, Ciego de Avila, and Camaguey. In total, groundwater accounts for approximately 35% of all available water usage in the country (Cubagua, 2007). A breakdown of water accessibility by province is provided in Table 1. Accessible water is defined as water that can be readily obtained through the country’s existing infrastructure. Cuba’s water treatment systems can be divided into two major categories: surface water treatment plants and groundwater chlorination stations. In total the country has 59 surface water treatment plants (see approximate location in Figure 2) of which 44 are reported to be in full working order (Cubagua, 2007). As expected, plant density and plant size are significantly greater in highly populated areas and near major watersheds. Existing water treatment plants in Cuba are mostly of Cuban and American design, with some being of Cuban and Soviet or European design (Cardona, personal communication, 2009). The predominant form of filtration utilized is rapid sand filtration. Rapid sand filtration is a process in which sand and coarse granular media are used to remove particles that have previously undergone flocculation. The water flows through the filter media by gravity and its solid constituents are captured by the sand. In Cuba several issues have plagued water treatment at surface water plants. At the up-stream of the process, during flocculation and clarification, the scarcity of chemicals and chemical dosing equipment severely hamper subsequent treatment and limit the quality of the plant effluent. There is also the issue of the quantity and appropriateness of the filter media. Rapid sand filters typically utilize silica sand or a composite mix of both sand and anthracite. Often, many plants do not have sufficient quantity of sand for their filters. The usual particle diameter necessary for the effective operation of the sand filters is from 0.95 mm to 0.55 mm. Unfortunately the sand that arrives at the plants is often not of the proper diameter for satisfactory operation. At the down-stream end of the plant, where disinfection normally occurs, the problems are similar in that chlorine is not readily available and dosing equipment is practically nonexistent (Cardona, personal communication, 2009). The result of these shortcomings is that only 62% of Cubans have access to reasonably disinfected water (CAFC, 2006). 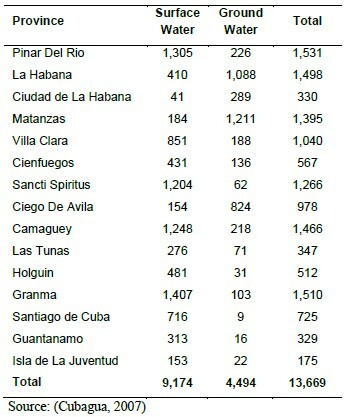 In the year 2007 Cuba’s total population was estimated to be 11.20 million (Population Reference Bureau, 2009). The INRH estimated that during the same year the total water demand in Cuba was 7260 million m3. This 7260 million m3/year is equivalent to 19.9 million m3/day, or 1.77 m3/person/day. This daily per capita number accounts for all water use classifications, and includes 19% (0.34 m3/day/capita) domestic water use, 12 % (0.21 m3/day/capita) industrial, and 69 % (1.22 m3/day/capita) agricultural (U.S. CIA , 2009). Considering these distributions, daily per capita domestic water consumption is significantly lower than domestic usage in the United States which is estimated to be 0.57 m3/day/capita (U.S. CIA, 2009). The total demand for domestic water use is 3.78 million m3/day or 1380 million m3/year. Comparing demand with treatment capacity, as presented below, offers a preliminary sense of Cuba’s ability to meet the country’s potable water supply needs. Table 2 below lists the total capacity of surface water treatment plants by province. Thus the total capacity of Cuba’s 59 surface water plants, when fully operational, is approximately 1.15 million m3/day, or 420 million m3/year. The amount of groundwater treated at chlorination stations is reported to be roughly 2.5 times the amount of the potable water produced by the surface water plants, namely 1,050 million m3/year (Cubagua, 2007). This brings the total potable water production capacity, neglecting losses in distribution, to 1470 million m3/year or 0.36 m3/day/capita. 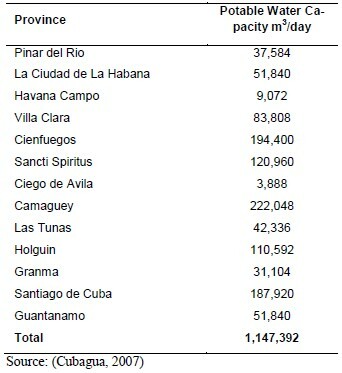 Comparing this capacity to the aforementioned domestic demand (0.34 m3/day/capita) indicates that Cuba has enough nominal water treatment capacity (i.e., assuming that the plants are actually working properly) to satisfy domestic water demand. Yet, due to a variety of issues primarily relating to the condition of the water distribution system, in particular the excessive amount of leaks, the demand is often left unmet (Cardona, personal communication, 2009) not because of lack of nominal treatment capacity but because of inefficiencies of the distribution system. The water distribution system of Cuba is managed on a national level by the govern-mental agency ― “Grupo de Empresas de Acueductos y Alcantarillados” (GEAAL) under the direction of the INRH. GEEAL is subdivided further into local entities who manage their respective provinces or townships. In total the nation’s distribution system is comprised of approximately 19,000 km of pipe network (Cubagua, 2007). Pump stations throughout the island are utilized to trans-port water from chlorination stations and water treatment plants to the general population. As of 2006 there were a total of 2,375 pump stations in operation in the country. The Cuban government utilizes three distinct classifications for the level of potable water accessibility. The three categories are ― “residential connection”, ― “public service”, and ― “easy access”. These categories correspond respectively with, possessing a water connection within one’s residence, receiving water from potable water trucks, and having a water connection within 300 meters of one’s residence. The percentages of each level of service for the years 2000 and 2005 are shown in Table 3. Most of the existing water distribution net-works on the island of Cuba have an average lifespan of more than 75 years (Cereijo, 1992). According to ― “Granma”, the official newspaper of the government in Cuba, more than 50% of the water pumped through the distribution system is lost due to deteriorated piping (BBC, 2009). The most affected city, according to the newspaper, is Santiago, where in some cases citizens do not receive water for several days. GEEAL has made up to an average of 18,000 pipe repairs a month, yet these efforts have not been effective since once a repair has been made a leak appears elsewhere in the pipeline. In addition to the challenges associated with the pipe networks, pump stations have been unreliable due to breakdowns in equipment and the lack of backup pumps (Perez et. al, 2009). The deficiencies in the water distribution system provide a different perspective on the topic of water availability in Cuba. Although there appears to be a near match to potable water demand, the reality is that due to the state of the distribution system water demand is not met because it does not reach the population. There are a number of high priority measures that would be effective in providing the population of Cuba with a higher level of service in the short term. The most pertinent improvements involve water quality and the water distribution system. In regards to water quality the most significant improvement would involve the increase of sodium hypochlorite production capacity. This would serve to ensure a consistent chlorine supply for use at groundwater chlorination stations and surface water treatment plants. As presented earlier, it appears that the nation’s current nominal water treatment capacity is enough to satisfy domestic demand. Therefore, the repair of pipe networks and pumping equipment would rank high on the list of priorities, and would potentially re-solve the issue of potable water availability. Methods for pipe replacement and rehabilitation include pipe bursting and cured-in-place pipe lining (CIPP). Pipe bursting and CIPP are two types of trenchless technologies that involve the rehabilitation and renewal of piping while minimizing disruptions to traffic and other activities by avoiding the excavation of trenches (ISTT, 2010). Pipe bursting involves the fracturing and displacement of existing pipe using a bursting tool while simultaneously pulling new pipe into the void left behind by the bursting operation (Simicevic and Sterling 2004). CIPP is the repair of existing pipe via the insertion of a liner, often polyethylene, which seals the interior of the pipe and protects against leakage. A schematic of pipe bursting is provided is in Figure 4. The development of cost estimates is challenging given the limited amount of detailed information on Cuba’s existing water and wastewater infrastructure. The cost estimates developed in this paper provide an approximate upper bound for the previously stated high priority improvements, and will reflect the estimated cost of such improvements if they were performed in the United States (and/or other developed countries in the case of wastewater), since specific cost information is not available for Cuba. The costs of repairing or replacing existing potable water pump stations, which provide the pressure to transport water through pipes from one location to another, were developed utilizing US. EPA Water Treatment Cost Estimating Handbook published in 1979 together with certain simplifying assumptions. To arrive at an average flow for each pump station, the total potable water demand for the country was divided by the number of potable water pump stations on the island, namely 2375. The total head requirement for each station was taken to be 100 feet, enough to supply a 3 story building lacking dedicated pumps, and the average pump efficiency was set at 75 percent. A break horse power analysis was done to find the size of the average potable water pump station and applied to the total number of pump stations in the system. Upper and low-er bound cost estimates were developed. The cost of pipe rehabilitation through CIPP or pipe bursting varies considerably depending on location and the diameter of pipe to be replaced. Approximately 80 % of all water mains are distribution pipes of small diameter such as 6 to 12 inch. According to the U.S. EPA in the average price of CIPP rehabilitation of an 8 inch sewer main ranges from $25-$65 per linear foot; it is assumed here that the cost of CIPP water main rehabilitation is approximately within the same range. The average cost to replace 12 inch pipe via pipe bursting ranges from $35-$75 per linear foot (Semicevic and Ster-ling 2004). Alonso Hernandez and Mon (1996) stated that 1,800 kilometers of Havana’s 3,594 kilometers of water distribution network are in bad condition; this indicates that approximately 50% of the network would need to be improved. Assuming the same proportion applies to the entire island, the total length of pipe to be rehabilitated or replaced comes to 9,500 kilometers. The cost range for each method along with the required length of pipe to be repaired provides a theoretical upper and lower bound cost. The estimated costs of the rehabilitation can be found in Table 6. An increase of sodium hypochlorite production would require moderate capital investments and continued operation and maintenance costs. A benefit of utilizing sodium hypochlorite for disinfection is its safety relative to chlorine gas. Chlorine gas, as op-posed to sodium hypochlorite, can leak easily from compressed gas tanks. This gas is extremely toxic and thus represents a safety hazard if not handled properly. This hazard can be avoided through the use of a liquid disinfectant such as sodium hypochlorite. Another advantage to sodium hypochlorite is the ability to produce the chemical on site. The disadvantages include the large weight and volume of chemical required for disinfection compared to other alternatives. The cost estimate of the proposed sodium hypochlorite system is based on a dosage of 4 milligrams per liter to 100% of the potable water supply, and was obtained using the US. EPA Water Treatment Cost Estimating Handbook. These values were then adjusted to reflect present day costs (ENR, 2009). The final values obtained utilizing the US. EPA cost estimating handbooks were cross referenced with the cost of recent on site sodium hypochlorite generation projects undertaken in South Florida (Vadiveloo, personal communication, 2010) to ensure accuracy. The comparison indicated that the cost estimate generated in this paper was comparable to present day construction and operation and maintenance costs. The investment of onsite hypochlorite generation proved to be small in comparison to the cost of improvements needed for the distribution system. The approximate cost of the chlorination system can be found in Table 7. Like the potable water distribution system, most of the current wastewater infrastructure in Cuba was built over 50 years ago and has not been well maintained or rehabilitated throughout its service life. Furthermore, the wastewater treatment system is not as extensive as the water distribution systems and generally lacks complete integration of a wastewater collection network with a wastewater treatment plant. The sanitary sewer coverage for the entire island is considered to be at 94% for the cur-rent population of 11.20 million. The 94% coverage has two major components: 38% consists of connections to wastewater collection systems, and 56% consists of in-situ wastewater systems; 6% are without service (PAHO, 2000). Rural areas have a relatively lower percentage of sanitation coverage, with 84% of the population with access to wastewater collection facilities; in urban areas 97% of the population has access. However, 56.3 % of Cuba’s population under coverage is being served with the use of septic tanks and latrines: 49.6% in the urban areas and 76.9% in the rural areas (Cubagua, 2007). In the year 2000, an estimated 19% of the wastewater collected underwent some sort of treatment (PAHO, 2000) and this was reduced to 4% as of 2007. The rest of the wastewater is discharged into nearby water-ways with minimal to no treatment (Belt and Velazquez, 2007). In 2006, INRH reported a total of 121 wastewater pump stations, 470 septic tanks and 862,121 seepage pits throughout the entire island. The most common form of treatment is through the use of stabilization lagoons that range from anaerobic, to aerobic and facultative. As of 2006, the INRH was directly responsible for 302 lagoon systems. Of these lagoon systems, 241 (79.5%) have been rehabilitated and only 53 (17.5%) are given the designation ― “efficient” (Cubagua, 2007). INRH also plays a role in the assessment of approximately 1200 oxidation lagoons that belong to others. Facultative stabilization lagoons are the most common form of industrial wastewater treatment on the island (Rodriguez, 2009). In addition to stabilization lagoons, wetland systems or trickling filters are also utilized in some areas. According to the National Institute of Hydraulic Resources (INRH), there are 8 wastewater treatment plants in Cuba. How-ever, through further investigation, a total of 11 existing plants have been identified, which can be seen in Figure 5. Two of the plants are located in the City of Havana (Maria del Carmen and Sistema Central) and two of them are located outside the city within the province of La Habana (Quibu and Bejucal). Wastewater treatment plants of low capacities can be found in Santiago (La Cuba) and Villa Clara (Ensenachos), while the other known plants can be found in Cayo Coco (EDAR Unidad Cojimar) and Varadero (Siguapa and Taino I) to serve the tourism industry. Garcia-Armisen et al. (2008) highlight a constructed pilot solar aquatic system facility built in the City of Havana for alternative wastewater treatment. 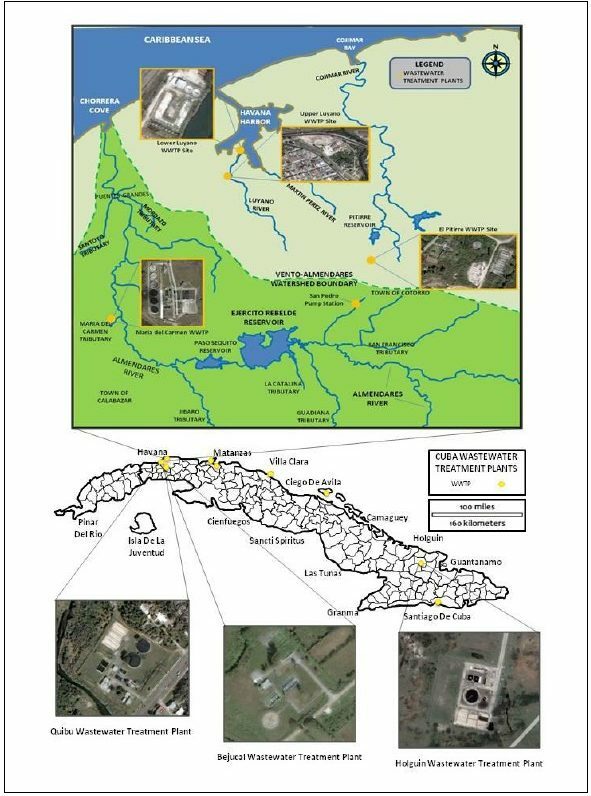 Through satellite imagery another wastewater treatment plant was located in Holguin which was not referenced by INRH, but its capacity or other information about it is not readily available. In 2005, only 5 of the aforementioned wastewater treatment plants were considered ―”efficient” and only 4 were ―efficient‖ in 2007 (Belt and Velazquez, 2007). However, a more recent issue of Opciones – an economics newspaper in Cuba – dated September 2008 includes an interview of Nobel Rovirosa of the National Center of Hydrology and Water Quality in Cuba (CENHICA) which reveals that in the entire country only 2 treatment plants are operational: Quibu and Maria del Carmen (Bueno, 2008).There are also several wastewater treatment plants that are being planned and constructed throughout Cuba – mostly in the City of Havana – with the use of international funding made available to the Cuban government for specific sanitary infrastructure projects. There are two conventional wastewater treatment plants (Maria del Carmen and Sis-tema Central) in the City of Havana and one small unconventional plant (Solar Aquatic System). The conventional wastewater treatment plants serve two of the six existing collection networks. These six networks consist of more than 1570 km of sewer mains and laterals, 23 pump stations, and 15 stabilization lagoons. Originally built for almost 1.2 million inhabitants many years ago, these six major collection networks (Sistema Central, Maria Del Carmen, Almendares Sur, Cotorro, Alamar and Puentes Grandes) serve approximately 55% of the city population of over 2.2 million people. The sanitation coverage for the rest of the population is managed by septic tank cover-age (26%) and smaller wastewater collection networks (12%). The remaining 7% of the population in the nation’s capital does not receive any type of sanitation coverage (Alonso Hernandez and Mon, 1996). secondary treatment and is currently presumed to be non-operational. The Maria del Carmen wastewater treatment plant is situated in the middle region of the Almendares watershed within the Maria del Carmen network which serves population of about 20,500, and consists of approximately 89 km of sewer lines built in the 1960s (Alonso Hernandez and Mon, 1996). The Maria del Carmen wastewater treatment plant consists of primary settling, a trickling filter process, secondary sedimentation and finally sludge digestion. Even though the plant was out of service for several years and would discharge its effluent directly into the Almendares River in Havana (Olivares-Rieumont et al. 2005), now the treatment plant seems to have been rehabilitated and is currently in operation, although at very low capacity and with treatment at sub-optimum levels (Garcia-Armisen et al. 2008; Bueno, 2008). The last of the operational treatment plants in the City of Havana is a small operational pilot wastewater treatment facility which was built in the lower region of the Almendares watershed. The solar aquatic system plant was built to treat the effluent of 5,000 inhabitants. The wastewater goes through a grit chamber, a blending tank, aeration tanks, a settling tank and finally a sand filter. The aerated tanks are each covered with various species of aquatics plants (Garcia-Armisen et al. 2008). This plant was found to be working efficiently in a study comparing three types of wastewater treatment facilities in Cuba including a conventional wastewater treatment plant (Maria del Carmen) and a constructed wetland. Along with the expansion of the Maria del Carmen wastewater treatment plant, there are two other wastewater treatment plants that were to be funded by a $10 Million loan from the Organization of Petroleum Exporting Companies (OPEC) in order to improve the sanitary infrastructure in City of Havana along the Almendares River. The first treatment plant, El Pitirre, lies in the upper region of the Almendares watershed within the wastewater collection system of Cotorro which was built in the late 1960s and early 1970s. The municipality of Cotorro consists of approximately 72,000 inhabitants of which almost one-third is connected to the 23.5 km sewer network. The system design consists basically of a main collector which draws the wastewater to a pump station in San Pedro, which in turn pumps the waste-water to El Pitirre wastewater treatment plant (Artiles Egües, and Gutiérrez Díaz, 1997). Until the construction of the treatment plant is complete, the wastewater was intended to be discharged into El Pitirre reservoir 1 km away, which was to act as a stabilization lagoon. However, the San Pedro pump station has since become inoperative and the wastewater from the municipality of Cotorro is currently being discharged into the San Francisco River – a tributary of the Almendares River system (Artiles Egües and Gutierrez Diaz, 1997). This situation is of high concern as it may be very detrimental to the primary drinking water supply for the City of Havana: the Vento Aquifer. This aquifer is hydraulically connected to the Almendares River (Perez et al., 2009), especially in upstream reaches of the river which is where the wastewater is discharged from the municipality of Cotorro. The second proposed wastewater treatment plant to be funded through OPEC was to be located in the lower region of the Almendares watershed in the Puentes Grandes network designed to serve up to 200,000 people (Artiles Egües, and Gutiérrez Díaz, 1997). Even though the system has 80% of its population connected to lateral sewer lines, the system lacks a main trunk line or a wastewater treatment plant, and most of the wastewater is discharged directly into the Almendares River (Alonso Hernandez and Mon, 1996; Artiles Egües, and Gutiérrez Díaz, 1997). Due to its elevated cost, the construction of the Puentes Grandes Waste-water Treatment Plant has been postponed and a more cost-efficient alternative using a subaqueous outfall to the ocean is being evaluated (Salas, 1997). Besides the two aforementioned plants that are waiting to be completed as part of the comprehensive plan to improve the sanitary infrastructure along the Almendares River, there is also a comprehensive sanitation plan to improve the sanitary infrastructure surrounding the Havana Bay. The Cuban government, with the support of the United Nations Development Program, has plans to construct four new treatment plants (referred to here as Upper Luyano, Lower Luyano, Luyano 3, and Martin Perez) to treat all the municipal wastewater from the tributary rivers flowing towards Havana Bay. These plants will collectively treat wastewater generated by over 100,000 persons. Three of the plants will be constructed along the Luyano River, the main source of organic and industrial wastes to the bay, and the fourth plant will be constructed on the Mar-tin Perez River (GEF-UNDP 2002). The discussion below will focus solely on the plans for the Upper Luyano and Lower Luyano Wastewater Treatment Plants. More specific information for the remaining plants, planned for the tributary rivers of Havana Bay, Luyano 3 and the Martin Perez, was not available at this time. One of the first wastewater treatment plants to be constructed is a $1.3 million plant at the outlet of the Luyano River (see Figure 6). With an 86400 m3/day capacity, the Lower Luyano Wastewater Treatment Plant will consist of primary treatment of 4 rectangular clarifiers with a mechanical and chemical system to eliminate suspended solids, toxic matter and heavy metals. Part of the treatment process also includes the use of sludge drying beds which will allow use of sludge as fertilizer. As part of the comprehensive plan, a solid waste trap is also being built to stop the majority of industrial and residential waste solids flowing into Havana Bay (UNDP 2001). Approximately 1 km upstream of Lower Luyano Wastewater Treatment Plant is the site of a second treatment plant on the Luyano River (referred to here as the Upper Luyano Wastewater Treatment Plant)(see Figure 7). With a total cost of $24 million, the project includes the construction of an advanced treatment plant that will include primary and secondary treatment including clarifiers, and tertiary treatment with nutrient removal of nitrogen and phosphorus. The wastewater treatment plant will also include a demonstration project focusing on utilizing sludge for fertilizer and/or energy. When completely finalized, the Upper Luyano Wastewater Treatment Plant will serve a population of about 70,000 people in the Luyano River area with a total capacity of 51,840 m3/day divided into three equal phases. Some of the funding will also go into constructing 7.5 km of new sewer lines in the Luyano River area (GEF-UNDP 2002). In 2006, the Upper Luyano plant construction was still in the earthwork stage and experiencing millions of dollars in overruns. A major contributor to the delays in the project were the hurricanes of 2004 and 2005 and it is very likely that the three hurricanes and two tropical storms that affected Cuba in the summer of 2008 – tropical storms Fay and Hanna and the hurricanes Gustav, Ike, and Paloma – also caused additional delays. Outside of the City of Havana there are 8 existing wastewater treatment plants, most of which were created to serve touristic areas. However, as seen in Table 9, only one of them, Quibu, is actually operational. Built several kilometers west of Havana on the Quibu River, the Quibu Wastewater Treatment Plant had an approximate construction cost of $2.0 million (GEF-UNDP 2002). It has a design capacity of 12,960 m3/day, but is running at approximately 6910 m3/day (Evelio Gutierrez et al. 2007; Bueno, 2008). The general treatment configuration of the Quibu wastewater treatment plants is roughly the same as for the Maria del Carmen plant. The treatment process involves screening and then primary sedimentation using settling tanks. Then the wastewater flows through a biological trickling filter and undergoes secondary sedimentation be-fore it is discharged as effluent. The sludge is processed through an anaerobic digester (Bataller et al., 2007). The Quibu Wastewater Treatment Plant is expected to double its capacity to 25920 m3/day in the near future (Evelio Gutiérrez et al., 2007). Approximately 23 km south of the capital is Bejucal: one of the 26 municipalities within the province of Havana with a population of about 25,000. Built in the 1960s, the Bejucal Wastewater Treatment Plant consists of primary treatment in the form of rectangular clarifiers and secondary treatment with bio-logical treatment with a capacity of about 7,780 m3/day. Unfortunately, like many of the other wastewater treatment plants on the island, the Bejucal Wastewater Treatment Plant is not operating properly and the wastewater effluent is being discharged into a nearby river (Crespo Dorado et al., 2005; Bueno, 2008). In November 2009, the Kuwait Fund for Arab Economic Development signed an agreement with the Cuban government to lend the country $15.42 million for a project to rehabilitate and modernize the water supply system in the City of Holguín. The project will involve rehabilitating and modernizing wastewater treatment plants, potable water distribution networks, pumping stations and storage tanks in the province of Holguín. This proposed work is in the planning stages and will most likely involve the expansion of the plant located in Holguin, which can be seen in Figure 5. Additional information about the remaining five wastewater treatment plants (La Cuba, Ensenachos, EDAR Unidad Cojimar, Sigua-pa, Taino I) was not available at this time. Assuming the domestic wastewater flow to be 80% of the potable water demand, the domestic wastewater flow for the island of Cuba is estimated to be 1103 million m3/year or approximately 3.02 million m3/day. This gives us an approximate wastewater demand per person to be 0.27 m3/day in Cuba. Taking into account that approximately 8.5 million of Cuba’s population lives in urban areas, the pro-rata urban wastewater demand would be about 2.30 million m3/day. If all of Cuba’s existing treatment plants were fully operational, the country could count on a wastewater treatment capacity of 107,900 m3/day. However, since we know that probably only the Maria del Carmen and Quibu treatment plants are functioning, and at approximately a third of their full capacity, the current operational wastewater treatment capacity for Cuba can be estimated to be 21,600 m3/day. Once completed, the two plants on the Luyano River in Havana are expected to add 138,240 m3/day to the nation’s wastewater treatment capacity. 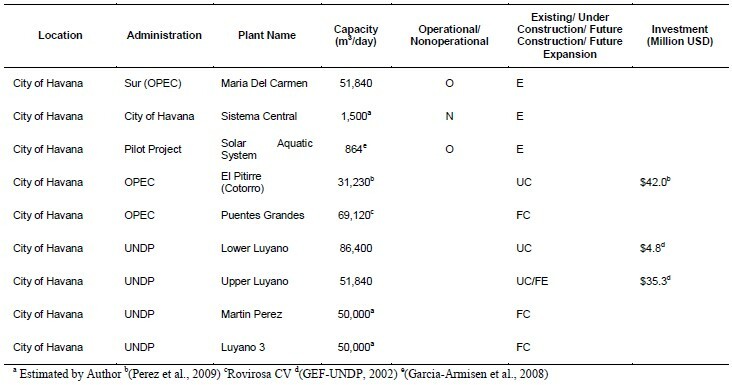 Using known and estimated capacities in Tables 8 and 9, if all the wastewater treatment plants were rehabilitated to full capacity and new ones currently in construction were finished, the wastewater treatment capacity for the island would only be enough to treat approximately 400,000 m3/day, less than one fifth of the country’s urban daily wastewater flow. Significant investments must be made to construct new wastewater collection and wastewater treatment systems in areas where this infrastructure does not exist. Another important priority is the rehabilitation of the existing wastewater infrastructure, including all wastewater treatment plants, pump stations and stabilization lagoons. Priority should be given to the protection of source water quality throughout the major watersheds on the island (Solo-Gabriele and Perez, 2008) with an emphasis on wastewater treatment in highly populated areas such as the City of Havana (especially in areas impacting the Vento Aquifer), Santiago de Cuba, Holgiun, Cienfuegos, Camaguey, Santa Clara, Cienfuegos, Las Tunas, and Bayamo. The cost needed to rehabilitate the non-operational wastewater treatments plants found in Tables 8 and 9, was determined using cost estimation tables established for the country of Colombia (Peter Robinson, Hazen and Sawyer P.C., personal communication, 2009). Given their very small capacities ranging from 1469 m3/day to 20,000 m3/day, the total cost needed to rehabilitate the eight plants (Sistema Central, Bejucal, La Cuba, Ensenachos, EDAR Unidad Coji-mar, Siguapa, Taino I, Holguin) and expand them to secondary treatment is estimated at almost $45 million. In order to estimate the cost of new waste-water treatment plants that need to be implemented in the major cities within Cuba, it seems reasonable to consider the major cities, that is, those with populations over 100,000 (15 of them) as these warrant a high priority. Using per capita costs of secondary treatment plants (activated sludge) constructed in the country of Chile (Artiles Egues, personal communication, 2009), the lower bound estimate of new construction of wastewater treatment plants for the 15 major cities in Cuba is estimated at $188 million and the upper bound at $553 million (Table 10). Pump stations are an integral component of wastewater collection systems and must be taken into account for prioritization and cost estimation of wastewater infrastructure needs. A cost estimate was developed for the construction of pump stations in the 15 major cities in Cuba noted in Table 10. In order to serve the 5,345,000 people in the 15 major cities, an estimated 500-750 pump stations would be needed each serving a population between 7,000 – 10,000. A break horse power analysis was done to find the size of the average potable water pump station and applied to the total number of pump stations in the system. The upper and lower bound cost estimates can be seen in the Table 11. In order to account for the cost of restoration or replacement of the sewer pipes throughout the island, an approach was used similar to the one used for estimating the water treatment needs. Knowing the amount of sewer pipes and the population in the City of Havana, one can determine the amount of linear pipe per capita for this major city and use this per capita number for the rough estimation of the amount of linear pipe of all the 15 major cities in Cuba. Using this method, the amount of sewer pipe needed to meet the demand of the major cities in Cuba is estimated to be 3674 km. The average price of installation of an 8 inch sewer main ranges from $80-$96 per linear foot (Hazen and Sawyer, personal communication, 2010). This results in a lower bound estimate of pipe rehabilitation of $964 million and an upper bound of $1,157 million. In the City of Havana, priorities in wastewater infrastructure are aligned with the protection of the water supply, with an emphasis on the upper and middle regions of the Almendares watershed which have a strong connection with the Vento Aquifer, the primary drinking water source for Havana’s population. The rehabilitation of the San Pedro pump station and transmission pipe is the highest priority, with an estimated cost of $2.3 million (Perez et al., 2009). It is also important to expand the wastewater collection network in Cotorro to service the remaining domestic and industrial sources in order to increase coverage and avoid dis-charges directly into Almendares River tributaries. The completion of the Pitirre wastewater treatment plant has an estimated cost of $26 million for primary treatment, $44 million for secondary treatment and $47 million for tertiary treatment (Perez et al., 2009). Even though it is important, the completion of the Pitirre wastewater treatment plant has less priority since once the San Pedro pump station is in operation, the wastewater from Cotorro is discharged outside of the Almendares watershed into the Pitirre reservoir acting as a stabilization lagoon. Perez et al. (2009) and Artiles Egües and Gutierrez Diaz (1997) provide a more detailed priority investment list for the waste-water infrastructure for the Almendares watershed. Regarding the choice of type of treatment system, due consideration should be given to natural systems such as constructed wetlands and solar aquatic systems, as alternatives to conventionally engineered wastewater treatment plants. Studies have shown that these natural systems work well in tropical and developing countries such as Cuba. These environmentally friendly systems show good efficiency in urban and periurban areas, while having generally lower capital and maintenance costs than a conventional wastewater treatment plants. 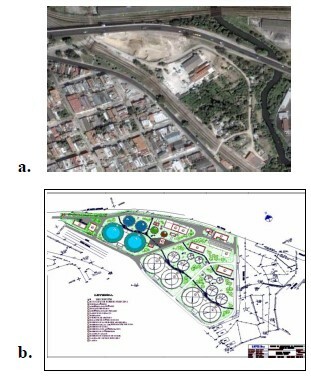 A study per-formed in the City of Havana comparing the performance of the Maria del Carmen wastewater treatment plant, a solar aquatic system and small-scale constructed wetlands concluded that natural systems effluent quality was much better than that of conventional treatment (Garcia-Armisen et al., 2008). As part of the comprehensive sanitation plan for the Havana Bay, the performance of small-scale constructed wetlands in the City of Havana should be further studied in order to determine the feasibility of larger-scale implementation throughout the island (GEF-UNDP 2002). However, given that these natural systems can be more land intensive than conventional treatment plants, special consideration must be given to the opportunity cost of land use for these purposes (Perez et al., 2009) as part of a cost-benefit analysis, since land could be valuable in Havana and other urban areas in an eventual market economy. Even though possibly difficult to implement, a greater degree of privatization of the water/wastewater sector should be evaluated. The successful experience of Chile shows that a well planned and executed privatization program can provide a more reliable service to the public, diminishing or even eliminating any issues with contamination of water sources and poor water quality. Private participation has already occurred in the city of Havana and Varadero through a 25-year water concession contract with Aguas de Barcelona in 1999 (Belt and Velazquez, 2007) providing water and wastewater services for 468,811 inhabitants in Cuba. An alternative to privatization could be to simply make the government-run operation more business-like and efficient, as in the case of Puerto Rico (Rodriguez, 2009). Under either a privatization or self-improvement scenario, significant capital improvements will require higher monthly fees to be charged to users, users whose ability to pay is very limited at present. The experience with Eastern European transitions to market economies was that subsidies to the water/wastewater sector were needed in the initial years of the transition (Solo-Gabriele and Perez, 2008). Special consideration must be given to the economics involved with private sector involvement and whether or not the population can afford such service without subsidy. Since most of the available information is limited to the City of Havana, further assessments are needed for the wastewater infrastructure outside of the capital and in the other major cities in Cuba. The present condition of Cuba’s water and wastewater infrastructure warrants extensive improvements to both systems. The evaluation conducted has highlighted the major challenges the country faces with respect to water sanitation. The existing surface water treatment plants and ground water chlorination stations appear to have adequate capacity to meet the domestic water demand for the entire island, yet due to the heavy deterioration of the distribution piping; the system is not capable of meeting the needs of the population. Additionally, the quality of pot-able water could be improved significantly through the consistent addition of sodium hypochlorite as a disinfectant to the potable water supply. For wastewater, the existing infrastructure does not adequately meet the demands of the growing populations within urban centers. There are not enough wastewater treatment plants on the island, and a large majority of the existing plants are nonoperational or running at low capacities. Most cities do not have extensive sewer networks and existing lines are not complete and do not cover their proposed population due to lack of integration with a treatment plant. Even though construction of new wastewater infrastructure is taking place, the rate at which these projects are advancing have been unusually slow and this can lead to cost overruns and depletion of project financing. The recommended improvements with the highest potential impact on the water infra-structure of the country include the restoration and rehabilitation of the potable water distribution system (estimated at $2400 Mil-lion U.S. plus an allowance for maintenance) , together with upgrades to the water distribution pump stations (estimated at another $1100 Million) along with the construction and maintenance of sodium hypochlorite generation facilities for the disinfection of water (estimated at $17 Million plus $3 Million per year in operation and maintenance). The grand total cost of up-grades to the potable water infrastructure is estimated at about $3.52 Billion plus an allowance for yearly operation and maintenance. The wastewater treatment system is in need of integrated management and a much stronger emphasis needs to be placed in the rehabilitation of the existing wastewater infrastructure as well the construction of new wastewater infrastructure in locations of high importance such as densely populated urban centers and locations where the integrity of the drinking water aquifer is a concern. Due to the nature of wastewater disposal with regards to population density in urban centers as well as lack of rural cost-effectiveness, prioritization led to only the top 15 cities with population of over 100,000 being taken into account in the wastewater improvement cost estimates. These improvements include restoration and construction of wastewater treatment plants (estimated at about $550 Million), restoration and construction of wastewater collection pump stations (estimated at about another $450 Million), as well as the construction of the needed wastewater collection pipe networks (estimated at an added $1200 Million). The grand total cost of improvements to the wastewater infrastructure is estimated to be $2.2 Billion plus an allowance for yearly operation and maintenance. The total cost of all proposed improvements ranges is estimated at roughly $5.72 Billion U.S. Dollars plus operation and maintenance. If implemented, these improvements will provide a much higher level of service to the people of Cuba. Due to the uncertainty of the information available the cost estimates provided in this report are considered to order-of-magnitude estimates. The numbers should be checked again information gathered from field visits and from environmental engineering experts currently living in Cuba. Bataller, M., Véliz, E., Fernández, L.A., Hernández, C., Fernández, I., Alvarez, C., Sánchez., E., 2007. Effect of Ozone on Secondary Effluents Treatment for Agriculture Reuse. Ozone Research Center. Havana, Cuba. 1. This document reflects the collective guidance and review comments from individuals both within and outside the University of Miami Department of Civil, Architectural and Environmental Engineering. The authors would like to specifically thank the following individuals and organizations for their valuable time in providing ideas and review comments: University of Miami— Dr. Helena Solo-Gabriele; Camp, Dresser & McKee—Armando Perez, Victor Pujals; Hazen and Sawyer—Peter Robinson, Christopher Kish, Enrique Vadiveloo, and Orlando Castro. This work is based upon a literature review of available documents and information that is available through Google maps. The information presented herein should be ultimately ground-truthed against information gathered from field visits to the island and from those currently living in Cuba. My name is Xue Bai, a graduate student at Pratt Institute majoring in design management. We currently working on a project discussing water crisis in Cuba. I found this article very helpful and impressive. I wonder 8 years after it originally published any updates in data set, government regulation or business environment? I’d like to read and study more on this topic. The work on Cuba’s water infrastructure continues through a couple of avenues. We are currently evaluating perceptions of water quality in Cuba along with colleagues Enrique Pumar and Joseph Treaster. Also, there is a yearly student competition through the Association of Cuban American Engineers during which some student groups compete in Cuba water projects.